One of the best ensemble casts of the 1950s in television has got to have been those who assembled in France for the production of “The New Adventures of Sherlock Holmes”. Ronald Howard (no, not Opie!) was a fabulous Sherlock. He was likeable, intelligent, approachable and as soon as he finished his task for the client his mind was somewhere else. He was much more human than Brett or Rathbone ever played the character. Lestrade was played by Archie Duncan (he filled in as other characters during the series) and Richard Larke played Sergeant Wilkins. In all, there were 39 episodes of the half hour show. Needless to say, the mysteries were not in depth but they were entertaining. The part of our special friend Watson was played by Howard Marion Crawford. He was usually billed as H. Marion Crawford. Crawford and Howard played exceedingly well together and there is a chemistry there that isn’t rivaled by Bruce and Rathbone. Crawford plays Watson as intelligent, action oriented, fun loving and willing to take a risk. He’s also a social butterfly when it comes to the women. The first meeting of Holmes and Watson takes place in the first episode “The Case of the Cunningham Heritage”. The meeting is lifted almost straight out of Doyle; the rest of the story is not. In fact, little of the canon is used in the 39 stories but each episode is very true to the spirit of the characters. My personal favorite is “The Case of Harry Crocker” with Eugene Deckers playing the title character. Deckers would play various parts in 7 episodes and I don’t believe that any actor who stepped on the set was used less than twice. The sets had that late Victorian look but one could tell that production costs were kept low. Still, Crawford made an exceptional Watson; one that you could believe was a principled, honest fellow. H. Marion Crawford’s background was almost more American and Italian than English. He was born 17 January 1914 and died 24 November 1969 at the early age of 55. His family had emigrated to the colonies in the 17th century and included governors of the State of Rhode Island, General Francis Marion (the Swamp Fox of the Carolinas – remember the Disney TV show with Leslie Neilson playing the lead? ), Thomas Gibson Crawford the sculptor who made the bronze statue “Armed Freedom” which sits on top of the US capital, F. Marion Crawford, the novelist and General Hiram Berdan, inventor and father of the American sniper units of the Civil War (Berdan’s 1st and 2nd NY Regiments of Sharpshooter). Howard’s being born in England was almost an accident as his mother and father were married in Singapore. His father, Harold was working as a manager of a rubber plantation and his mother was performing in a traveling musical theatre review when they met. Howard was little more than a year old when his father was killed in a training accident in France where he was a Lieutenant in the Irish Guards. Howard would attend Clifton College and then the Royal Academy of Dramatic Art. During his career he had much more success as a radio actor than any other field. He appeared in about 50 films plus television. He served in the Irish Guard in WWII but was, like Watson, discharged after injuring his leg. He then enlisted in the RAF and became a bomber navigator. After the war he went back to acting and in 1948 played Sherlock Holmes in a radio production with a gentleman named Finley Currie playing Watson. The Sherlock Holmes series was possibly the high point of his career. He was also featured in 5 Fu Manchu movies and appeared in such classics as: The Longest Day, Lawrence of Arabia, The Charge of the Light Brigade and North West Frontier (where he worked again with Eugene Deckers). What did H Marian Crawford die of . He was only 55? Accidental alcohol and sleeping pill overdose. I RECENTLY DISCOVERED THE DVD COMP WITH ALL THE T.V. EPISODES! I LOVE IT! WITHOUT A DOUBT MY FAV HOLMES IS R.HOWARD AND MY FAV WATSON IS H.M.CRAWFORD! I LOVE THE “IMPOSTER MYSTERY” EPISODE! AND A.DUNCAN’S REPLY OF “RIDICULOUS! !” WHEN HOLMES TELLS LESTRADE AGAIN OF THE FAKE HOLMES! WHAT A GREAT CHEMISTRY ALL THE ACTORS HAD! NOT ONLY ENTERTAINING, BUT GENUINELY BELIEVABLE AND LOVABLE CHARACTERS! I AM JUST SORRY THAT THEY ARE GONE NOW,..AND I CAN’T TELL THEM HOW MUCH I LOVE THE SHOW!! I THINK SIR ARTHUR HIMSELF WOULD HAVE APPROVED! , I PLAY THEM FOR MY FRIENDS , WE ARE ALL BETWEEN 35 AND 45 AND EVERYONE JUST LOVES THIS SHOW!!!!!!!! Thank you so very much for this history ! I too, recently acquired the Howard/Crawford series. They do grow on one ! Though, Rathbone was amazing ! I do really like Crawford’s Watson. Some of the episodes are rather frustrating in that they take the time to create an intriguing scenario, only to wrap it all up in one or two lines, and then the credits are rolling..(!!). A shame they never made a full length film with this ensemble.., they had some great characters ! 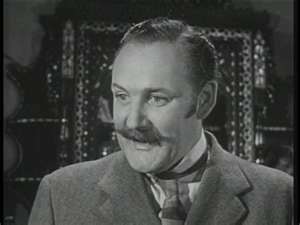 Archie Duncan was terrific as Lestrade, and I particularly liked Eugene Deckers. A favorite episode would be tough.., Deckers’ Harry Crocker is soo good, (among his other incredibly versatile characterizations..!! ), but being a noir fan, I’m going to go with “The Case of the Winthrop Legend”..!! Cheers fellow Holmes’ fans..!!! HOT TV (History of Television) airs a “Stunning” 3 or 4 of the episodes of the show. I hold 2 DVD’s that I got at the dollar store that has 3 episodes each. None of which HOT TV airs. My wife and I love this old series. Watch the episodes over and over. How frustrating it is to fall in love with a series only to find that it was much too brief. I understand there was talk of a second season that never came to be. Grrrrr . . . 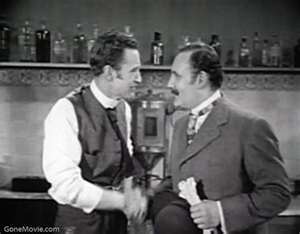 I really enjoyed Ronald Howard’s Holmes, but Howard Marion-Crawford’s Watson was the stand-out performance for me. He had to make Watson courageous but sometimes unsure of himself, intelligent but sometimes the fool, proud but content to be in Holmes’ shadow, sweet and decent with a sarcastic streak. Marion-Crawford managed to blend all that Watson needed to be, and was utterly adorable throughout. Pity it wasn’t in color- those great big eyes were a lovely shade of blue. My sister Victoria and I both love this show also. Basil Rathbone was always my favorite Holmes until i saw this series. Howard was Awesome as Mr. H., but Crawford is by far the best of all watsons. No contest. For those who are interested, the entire series can be found in a package with several of the older S.H. movies including a couple of the Rathbone films.